Since its inception in 1910, Scouting has not only made uniforming a requirement, but a symbol of pride, functionality, and a reflection of its core values. Scouts are reminded to keep to the Scouting code of conduct when in full uniform and are more likely to behave with politeness and dignity. They are reminded of the values of the organization as a whole, as well as what they have accomplished individually in their rank. Troops who meet in full uniform are additionally empowered with a sense of equality, sameness, and team comradery. While requiring a uniform presents a financial commitment, uniforming is actually intended to act as an equalizer between the most and least affluent families. Uniforming creates an environment in which Scouts are not divided by fashion or wealth, and are then able to better focus on the values. Money, or a lack thereof, should never merit a Scout going without a full uniform. Scouts may have uniform drives, fundraisers, find recycled uniforms at Good Will, Deseret Industries, or reach out to graduated Scouts for second-hand uniforms, their charter partner for financial coverage, or the BSA for donations. It’s crucial that parents and leaders fully support and exemplify the expectation of uniforming within Scouting. When gripes about purchasing new neckerchiefs or ironing on merit badges become a pattern of negativity from adult leaders, Scouts will feel that their program is being undermined, in addition to feeling that a uniform is an unimportant annoyance. Good uniforming within a troop starts and ends with a good Scoutmaster. He or she must exhibit a sense of pride in being clean, well-groomed, and in full uniform in accordance with Scouting standards. While the expectation should be set by adults, rewards can be a great incentive and way to recognize Scouts wearing tidy and complete uniforms. Ultimately, the uniform supports the program. When Scouts put on their uniforms, they are to be empowered with a sense of belonging and can take pride in what they’re representing to the world. A uniform also develops good dress and grooming habits for life, teaching youth how to present themselves and contribute to a group with common goals. 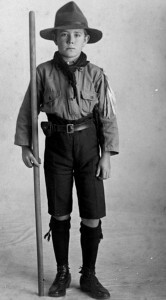 A full uniform includes the official shirt, pants, neckerchief, cap, belt, and socks. Packs and troops are not authorized to make changes to the uniform. It is not up to the unit to decide whether boys (or leaders) may wear the pants or shorts of their choice. Webelo Scouts may wear either the full blue/gold or the full tan/olive uniform (though uniform parts may not be mixed) depending on what they and their parents choose. The Webelo den does not make this choice as a den.